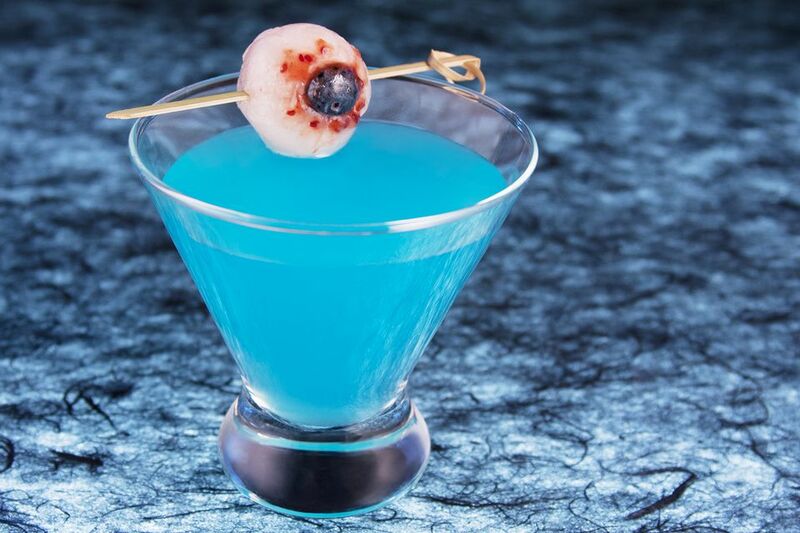 The mad eye martini is a perfect Halloween cocktail, complete with a gruesome eyeball garnish. The drink itself has that beautiful pale blue color, which is the signature of Hpnotiq, and the flavor is as pleasant as can be with its delicate lychee accent. Creating the creepy garnish is rather easy and may take a bit of practice to get the right look, but the membrane-like look of the Asian lychee fruit is a perfect base. It's a fun project to prepare before the party and can be used on any cocktail. Your efforts will pay off because this fruity vodka martini is sure to steal the show and light up everyone's night! Drain and dry the lychee, then fill with red fruit preserves. Place blueberry—blossom end facing out—into the cavity. Skewer with a cocktail pick so it will lay across the rim of a glass. Continue building eyeballs until you have enough to garnish all of the drinks you'll be mixing up. They can be refrigerated in a single layer inside a sealed container until the party. Check your local party store for Halloween-themed cocktail picks or skewers that look like a miniature ice pick to complete the ghoulish effect. Premium vodka is recommended for this cocktail because it has such a clean taste. Choose one that you wouldn't mind drinking straight and you'll have a great tasting martini. Lychee juice is not the most common ingredient, though you may have luck finding it at international grocery stores. For the garnish, you'll also need to hunt down canned lychees, which have the fruit's hull removed and are packaged in a syrup. The syrup is not the best substitute for a juice, though. As an alternative, mix up the martini with a lychee liqueur. To retain the martini's blue color, choose a clear liqueur as some take on a red or pink hue and will result in a purple cocktail. Homemade lychee syrup is also a viable substitute for the juice. It's a great alternative if canned or fresh lychees are your only option. You will, however, want to change the proportions or it will be too sweet: try 1 ounce Hpnotiq, 1 1/2 ounces vodka, and 1/2 ounce lychee syrup. If you skip the lychee ingredient and pair Hpnotiq with vodka, then add a splash of lemon juice, you'll have an equally impressive cocktail called the Halloween Hpnotist. It's typically "garnished" with a glow stick for an illuminating display but has the same look as this recipe, so it's a perfect fit for the eyeball! How Strong Is a Mad Eye Martini? As far as martinis go, this one's surprisingly light because most of the volume is comprised of lychee juice. Its alcohol content should fall into the 12 percent ABV (24 proof) range, making it equivalent to the average glass of wine.